Courtesy photo Meet Yoshi!, a 5- 7-year-old Shih Tzu. Yoshi came to us from Tennessee! He is a very sweet boy but is a bit shy. He needs a little time to warm up to you and then he’ll be your buddy. Yoshi loves to play with other dogs and toys!! Do you have room in your heart and home for this great guy? Yoshi is neutered, up to date on vaccinations, heart-worm tested, on flea and heart-worm preventative, groomed, micro-chipped, free 30 days of insurance and ready for his new home. To adopt Yoshi or any of our other furry friends looking for homes please visit www.sassrescue.com and complete an application. Come meet Yoshi and a few of his friends at Bow to Wow Grooming Shop 415 S. Main St in Urbana on Saturdays from Noon until 4:00pm. Let SASS Rescue help you find your perfect “Puppy Love Match.” SASS Rescue is a 501 c3 Non Profit that is ran strictly on donations and volunteers. We have no paid employees and we are always looking for volunteers. If you would like to help save the life of a shelter dog please contact SASS Rescue 937-303-SASS (7277) or email adopt@sassrescue.com, you can also find us on Facebook SASS Shih Tzu Rescue and Instagram @sassrescue. 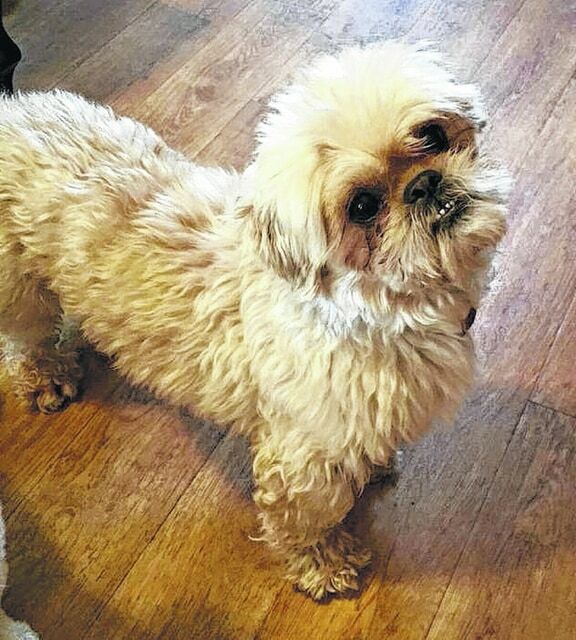 Meet Yoshi!, a 5- 7-year-old Shih Tzu. Yoshi came to us from Tennessee! He is a very sweet boy but is a bit shy. He needs a little time to warm up to you and then he’ll be your buddy. Yoshi loves to play with other dogs and toys!! Do you have room in your heart and home for this great guy? Yoshi is neutered, up to date on vaccinations, heart-worm tested, on flea and heart-worm preventative, groomed, micro-chipped, free 30 days of insurance and ready for his new home. To adopt Yoshi or any of our other furry friends looking for homes please visit www.sassrescue.com and complete an application. Come meet Yoshi and a few of his friends at Bow to Wow Grooming Shop 415 S. Main St in Urbana on Saturdays from Noon until 4:00pm. Let SASS Rescue help you find your perfect “Puppy Love Match.” SASS Rescue is a 501 c3 Non Profit that is ran strictly on donations and volunteers. We have no paid employees and we are always looking for volunteers. If you would like to help save the life of a shelter dog please contact SASS Rescue 937-303-SASS (7277) or email adopt@sassrescue.com, you can also find us on Facebook SASS Shih Tzu Rescue and Instagram @sassrescue.